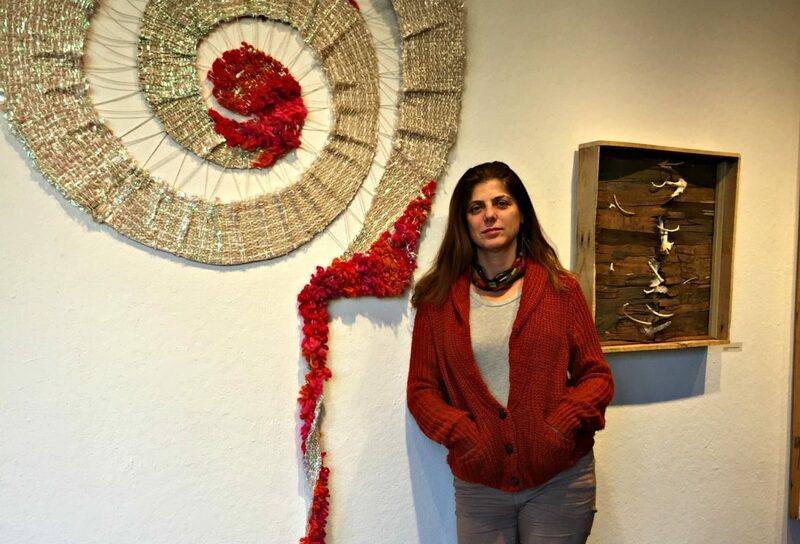 Worcester artist and native of Syria Bayda Asbridge, seen here with her artwork "The Dream of Alan Kurdi," is the principal artist in the Sprinkler Factory's "Healing Fibers" exhibit. Boom! The noise rose as the sculpture pedestal hit the ground. It made everyone stop and look. Noise is what happened that Saturday. The point of the art exhibit at the Sprinkler Factory was to make you stop and pay attention to indigenous cultures and oppressed people. At her exhibition, “Healing Fibers: Indigenous Art & Activism,” Bayda Asbridge creates a space in which the audience can see art, listen to music, contribute to charity, and participate in a raffle and silent auction. The exhibit runs through Nov. 26 in the East Gallery, 38 Harlow St.
On a recent Saturday night, the “Healing Fibers” exhibit was a place to hear the silent cries of those who do not have a voice. The artwork displayed all incorporated fibers in some way, and highlighted the event’s theme of indigenous culture and activism using various perspectives from history, philosophy, aesthetics and politics. In the corner, there was a stand selling Native American gifts. “Once you buy it, you can do what whatever you want with it,” the seller said. Cultural appropriation was the elephant in the room and the focus of the event. The sculpture, “Fellow Travellers I & II” by Charlotte Eckler, brought some sanity back to the affair. The sculpture was built from fabric and torn pages sewed together and made to resemble the shape of a strand of DNA. The piece tackled the issue of appropriation of the Inuit culture. According to the artist’s statement, people often appropriate Inuit culture by building Inunnguaq figures out of rocks. These figures are void of the meaning of inuksuit, which have greater significance for the Inuit, but they are often confused with inuksuit. “It is not the correct thing to do. My art is a critique of cultural appropriation,” Eckler said. Another piece that captured the essence of the event is “Scars of Pine Ridge” by Lynn Simmons, a visiting assistant professor of Art & Design at Assumption College. The aesthetics and material — such as cotton yarn and pine — all relate to Native American tribes. The piece comprises five patches of tightly woven cotton yarn attached to a pine branch in the form of braids. In these five differently colored patches, cotton yarn is stretched out like a scar. “The scars on the woven cotton yarn were accidental, but I came to see them as signifying the scars of Wounded Knee,” Simmons said. Some estimate that around 300 Lakotas died at Wounded Knee, and this piece demonstrates that the scars of the massacre have not yet fully healed. The art exhibit commemorated Stephen Twomey, an artist who passed away last year. His piece, “Tribal Council,” which depicts three Native Americans participating in a council, was the favorite of many attendees. “Mountain Man,” which members of his family submitted, was an homage to the artist. “It was fixed,” an attendee joked after the raffle results were in. The painting’s winner was Asbridge, the event’s main organizer. The raffle collection of $300 was donated to Refugee Artisans of Worcester, an organization that takes handmade craftwork from senior, former refugees in the Worcester area, sells them at events, and gives the profits back to them. This year’s “Healing Fibers” exhibit marked its fourth installation. In the previous three years, it took on issues such as abuse against women, war and peace, and the abuse of children. Abdullah Hajjar is a student at Worcester Polytechnic Institute. I’m happy that this article was published – great job Abdullah! I just have one correction that is not the journalist’s fault – the photo is Bayda’s, from an article / interview I did with her in December 2016. She sent me the photo for the article but the attribution should be Bayda Abridge. Another correction is an update for the donation amount to the Refugee Artisans of Worcester, which was almost $800 combined with the raffle amount. Artist donated very high quality work for it and the gifts really helped. This is my first experience as a journalist. I took lots of images. Next time I am going to provide my own images upfront. I too thank you for the article but I cannot take credit for what is not mine, nor let the purpose and integrity of why the quilt was made be misunderstood; which is to respectfully honor and portray victims killed by State Sanctioned Violence in the USA on the “Dearly Beloved, We Our Own Record Keepers” quilt.